I had a bunch of lemon curd left over from making the Luscious Lemon Cake and needed a way to use it up (besides just eating it with a spoon...*cough cough*). 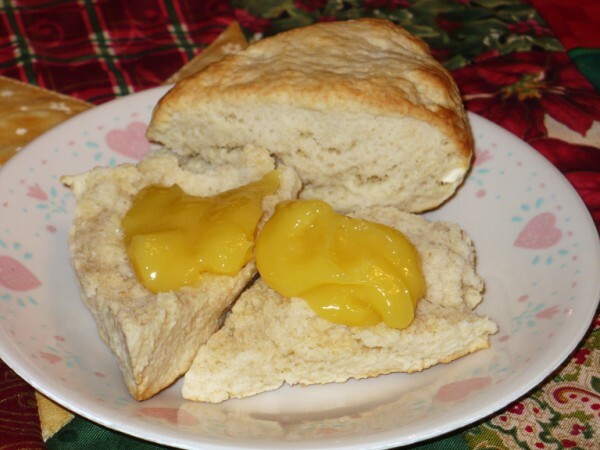 I found a recipe for scones with lemon curd on Simple Analogy and decided to give it a shot. 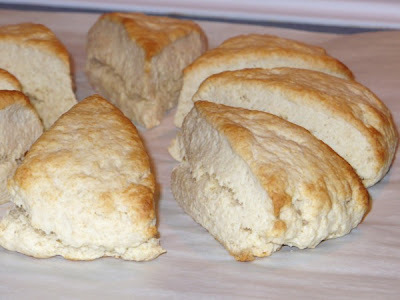 I've never had or made traditional scones before. They are similar to a biscuit, but are sweet. In all honesty I didn't much care for the scones by themselves, but once you add the lemon curd, holy moly I wished they weren't so darn filling so I could eat them all myself! I bet they'd also be great with strawberry freezer jam if you have it. 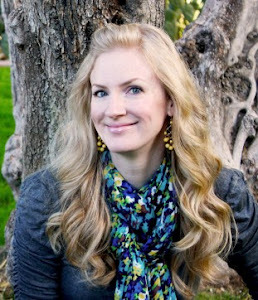 Heather also suggests adding chocolate or cinnamon chips to the scones and sprinkling the tops with cinnamon sugar just before baking for some variety. Seriously, you could add whatever you want. Just don't eat them plain. Preheat oven to 425 degrees. In medium sized bowl, mix flour, baking powder, salt, and sugar. Using a pastry blender, cut in butter until mixture resembles coarse crumbs. * Pour in milk and mix until dough can be shaped into a ball. 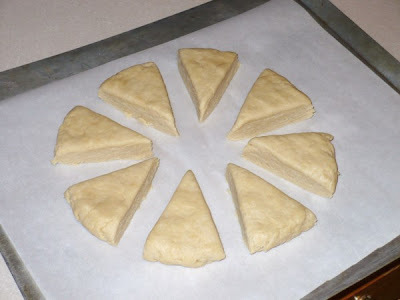 Press dough into a round disc (about 7-8 inches in diameter) on parchment lined cookie sheet. Cut into 8 wedges. Pull wedges about 1-2 inches apart and bake for 14-17 minutes. Cool before serving. *If adding chocolate or cinnamon chips, mix them in before the milk. In a medium saucepan, off heat, whisk together sugar, zest, and egg yolks; whisk in lemon juice and salt. Add butter and place pan over medium-high heat. Cook, whisking constantly, until butter has melted, mixture is thick enough to coat the back of a spoon, and bubbles form around the edge of pan (about 5 minutes). Do not boil.